! (feature_r)http://relayer.s3.amazonaws.com/articles/spreads/4d4177a954fb7c6e88000200.jpg!CSI: Crime Scene Investigation is still the most watched TV show in the world and its 10th landmark season begins after the infamous departure of Grissom (William Peterson) and the arrival of Dr Raymond Langston (Academy Award nominee and Emmy winner Laurence Fishburne) as he hits the ground running in the CSI hot-seat. To get you in the mood for the release of the thrilling complete 10th Season of CSI: VEGAS on DVD on Feb 7, here’s a clip from one of the best episodes of the season. In this, the 21st episode entitled “Lost & Found”, Nick and Ray investigate an old missing persons case when a woman gets into an accident on the exact stretch of road where her entire family disappeared three years earlier. With chilling twists and turns in the plot revolving around a very complicated family, this story proves CSI is still pouring out intense drama by the bucketload well into its 10th season. While Sara and Warrick look into a supposed case of spontaneous human combustion, Grissom, Catherine & Nick are working on a case of a thief found dead in a pottery store. While dusting for prints they discover a fingerprint of a kidnapped girl who has been missing for 21 years. This girl then turns into one of the creepiest characters of the series, a disturbed girl who is seemingly switching between two personalities, while playing everyone’s emotions to her advantage. Features a character named Paul Millander, a serial killer who escaped from Grissom in season 1. Then, while attending court, Grissom and Catherine discover that the judge looks exactly like the killer causing Grissom to investigate his past. An amazing episode featuring a character who was previously one who got away. A dramatic episode for recurring character Lady Heather, whom Grissom visits after two of her employees are found dead at separate locations. Meanwhile, there’s panic for Catherine after she receives a phone call from her daughter Lindsay, who is trapped alone in her father’s sinking car. Directed by Quentin Tarantino, these are two of the most famous CSI episodes. Nick is kidnapped and buried alive, while the CSI team are shown video footage of him, trapped and suffering from claustrophobia. Grissom meets the kidnapper with the ransom money but he blows himself up without revealing Nick’s location. It’s then a race against time to find Nick before his oxygen runs out, but they face a number of obstacles, including a bomb buried under Nick’s ‘coffin’. A teenage boy is on trial for the murder of his female classmate, but while on the stand, his 12-year old sister confesses to the murder herself. The CSI team are now faced with two people, both admitting to the same murder, and they have to decide whom to prosecute. Both the team and the viewer are kept guessing, jumping between both brother and sister in a classic whodunit. The serial killer nicknamed the ‘Miniature killer’ is finally revealed to be CSI lab cleaner Natalie Davis, and she has targeted Sara as her next victim. As Grissom races to rescue her, the season ends on a tense cliff-hanger as Sara is stuck in an upturned car in the Nevada desert. It is also a memorable episode because it is the first time that Grissom openly admits that he loves Sara, and shocks the rest of the CSI team with his revelation. The great saga of the Grissom and Sara love story seemingly comes to an end when Sara Sidle leaves the show in this dramatic episode. Psychologically burnt out after revisiting the case of Marlon and Hannah West, who have become embroiled in another murder, a broken Sara departs Las Vegas leaving a heartbreaking note for Grissom promising to always love him. This is Grissom’s last episode, and is the end of an era for CSI fans, but provides an introduction to Dr Ray Langston who is investigating serial killers at Grissom’s request. 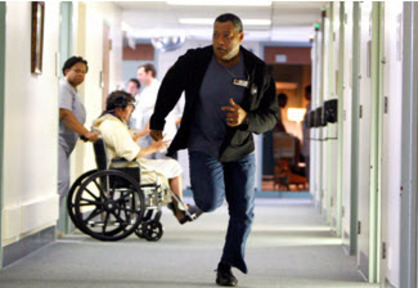 The strength and bond between the remaining characters is shown here as they face up to a reality without Grissom. It ends with an emotional reunion between Grissom and Sara. The second CSI crossover episode, but the first that features all three CSI series. In a case about a missing girl and supposed human trafficking, Dr Ray Langston heads first to Miami, then to New York, before the evidence finally leads him back to Vegas. It’s a very well executed trilogy of episodes that involve a great storyline and all the main characters from all areas of CSI. CSI: Vegas Season 10 is available to buy on DVD from Monday, February 7th. Check out the incredible three-minute bullet-time sequence that kicks off season 10 here.